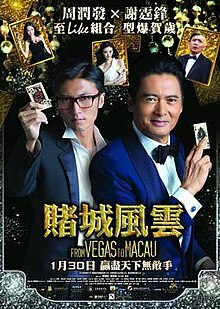 From Vegas to Macau (Chinese: 賭城風雲), also known as The Man From Macau (Chinese: 澳門風雲), is a Hong Kong-Chinese crime comedy film directed by Wong Jing. The film stars Chow Yun-fat, Nicholas Tse, Chapman To and Jing Tian. The film was released during 2014 Chinese New Year. A sequel titled From Vegas to Macau II was released on February 19, 2015. Meanwhile, Benz reunites with his old friend Ken, known as the "Magic Hand". Ngau-Ngau becomes infatuated with Ken's daughter Rainbow and is determined to win her affection, even though Ken eventually makes it known that he prefers "Cool" to date his daughter and Rainbow repeatedly rebuffs Ngau-Ngau's efforts. Lionel realizes his cover has been blown and hides the contact lens in a stuffed teddy bear at home without his family's knowledge. Ngau-Ngau gives the bear to Rainbow when he and "Cool" visit Ken's house. Mr. Ko sends an assassin to Lionel's flat, only to find Benz, who has just returned home. Benz is beaten and tortured and ends up in a coma while Lionel's body is found later, also bearing torture marks. Police detectives from China, Hong Kong and Macau decide to enlist the help of Ken to take down the wily and cunning Mr. Ko. Ken challenges Mr. Ko to a gambling match in hopes of provoking him into making a mistake. During the match he discovers that DOA's assassins have attacked his house and Rainbow, "Cool" and Ngau-Ngau are inside. Rainbow is put inside a glass tank, which has gas in it. During the match, Ken reveals that he had undergone through a surgery to implant a card sensor into his fingernail which allows the details of a certain card into the person's brain. The people following Mr. Ko start a revolution against him after watching Lionel Messi of Barcelona score against Real Madrid, winning them. After killing them all, Mr. Ko tries finding Ken. Ken starts shooting cards in retaliation. "Cool", is revealed to be wearing the mask of one of Mr. Ko's crew, whom had secretly diverted the ship back towards the waters, which police are now making their way to. While making their way towards the top, "Cool" and Rainbow meets the Assassin. "Cool" and the Assassin fight, which "Cool" ends him off with a few punches to his face, making him look like a duck. Mr. Ko starts to escape, only to be met by Ken. Ken now mercilessly shoots cards at Mr. Ko, striking him multiple times. Mr. Ko is later subdued by him, and arrested by the Police. While Ken is doing the disciple rituals with "Cool" on the first day of the Lunar New Year at his place, "Cool" receives a call from a mysterious someone, who also shows interest to take Cool as his disciple. Ken questions Cool who is more qualified to impart his skills to him. At this moment, the doors swing open. A man in his black suit, playing with his jade ring walks into the scene. "I believe I am qualified to take him as my disciple." This man was no other than God of Gamblers Ko Chun (from the God of Gamblers series) himself. Nicholas Tse as Cool 晒冷 "冷竟"
Chapman To as Ngau-Ngau 牛必勝 "牛牛"
The film's blessing ceremony press conference was held on 28 July 2013 at TVB City where it was attended by the cast alongside Mega-Vision Pictures representatives director Wong Jing and producer Andrew Lau, Television Broadcasts Limited production manager Virginia Lok, Polybona Films CEO Yu Dong, Golden Pictures Entertainment representative Yun Chi Yuen and Sun Entertainment Culture representative Paco Wong. Production started immediately after. The film's premise will be set in Macau. Director Wong Jing also revealed that the film was in planning stage for nine months and the final script was complete through a record of eight times of revision. The film grossed RMB24.8 million (US$4.09 million) in its opening day in China, with a total opening gross of US$12.5 million. It had grossed a total of RMB523,490,000 (US$84,570,000) in China at the end of its run. In Hong Kong, it has grossed a total of HK$33,557,657 (US$4,324,184). It earned a total of US$95.9 million internationally. The sequel titled From Vegas to Macau II will started production in June 2014. Chow Yun-fat and Kimmy Tong will be reprising their roles as Ken and Rainbow. Nick Cheung will be replacing Nicholas Tse as Chow's new protégé. Carina Lau also joins the cast. ^ Stephen Cremin (2013-11-07). "Mega-Vision close deals on Vegas to Macau". Film Business Asia. Retrieved 2013-11-13. ^ Peter Martin (2013-12-12). "Chow Yun Fat In THE MAN FROM MACAU Trailer: Flying Dice And Whirling Cards". Twitch Film. Retrieved 2013-12-17. ^ ""From Vegas to Macau" press conference, Chow Yun Fat and Nicholas Tse call each other their "idol"". ^ Kevin Ma (1 February 2014). "Monkey King has record opening in China". Film Business Asia. Retrieved 1 February 2014. ^ "China Box Office March 3–9, 2014". Box Office Mojo. Retrieved 24 April 2014. ^ "Hong Kong Box Office March 6–9, 2014". Box Office Mojo. Retrieved 24 April 2014. ^ Nancy Tartaglione and David Bloom (January 10, 2015). "'Transformers 4′ Tops 2014's 100 Highest-Grossing International Films – Chart". Deadline Hollywood. Retrieved January 10, 2015. ^ "Vegas to Macau II leads Mega-Vision slate". 16 May 2014. Archived from the original on 17 May 2014. Retrieved 16 May 2014.